I grouped up with 4 other people from my realm tonight and we spend 2 hours in Isle of Conquest trying to complete the daily. Unsuccessfully. We tried capping and holding the Hangar. We tried blowing up their base with seaforium bombs. We tried to cap the Docks from the outset. Closest we came to winning their keep was all rushing the Hangar and jumping down. However, perhaps it’s something to do with my interface, but I have absolutely no idea how to tell how much health the gates have left. 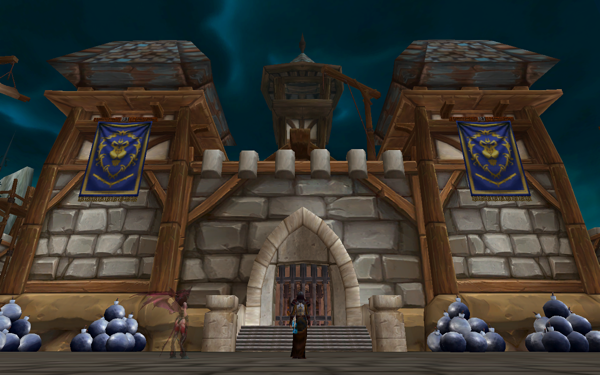 And I was under the impression that the West/East gates had less health than the Front gate of the keep, is that right? I have also heard that the side gates have less health than the front gates, but I don’t have any data to back it up. As far as seeing the health of the structures, I don’t know of any UI mods that allow you do to that. I think there’s a green bar that appears if you mouse over them. I’ll check that out tonight. But honestly, I just bang on them until they go down.